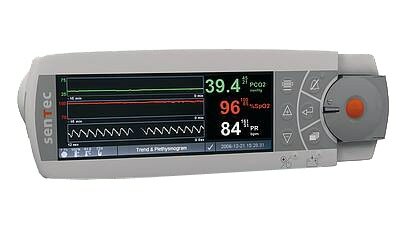 The SenTec Digital Monitor (SDM) is an easy-to-use bedside monitor for virtually all situations where continuous ventilation and oxygenation monitoring matters. It provides accurate and safe monitoring of tcPCO2, SpO2, PR, Pulsation Index (PI), and Heating Power and supports up to 4 configurable User Profiles to quickly adapt to current clinical setting and is highly configurable. Its Internal memory allows recording of several days worth of patient data.